The Child, Family and Education Studies Club hosted the conference along with the Child Development Center on Saturday at East Los Angeles College. The club felt it is important to inform parents on the way male teachers are unfairly treated. “We are not trying to victimize ourselves,” Billy Truong, the faculty advisor for CFES said. He said they are trying to create awareness to the biases and bring equality in ECE. He praised the club for bringing awareness to the topic. “This is the most selfless group of students i’ve seen in a long time,” Truong said. The conference included four workshops: Creating Male-Friendly Environments in ECE, The Road to Understanding (The Journey of Over 20 Years), Bridging the Gap for Men in ECE (Male/Father Engagement), and Learning through STEAM. Donald Williams, founder of the DAD Project, presented the Bridging the Gap for Men in ECE workshop. He talked about the importance of a dad’s role in his child’s education. He encouraged men to become more involved in their child’s classroom and/or the Child Development Centers. The clip was of Will Smith’s reaction to his dad walking out on him for a second time and was unscripted. Williams said there were many young men who go through the same feelings as Smith and that luckily, Smith’s character still had a father figure in his uncle Phil. Williams said it is important for boys to learn how to treat girls and for girls to learn how they should be treated. He believes male teachers should be given the opportunities to teach these lessons along with other basic lessons female teachers teach. He also believes fathers should help teach their kids on appropriate behavior and that being involved with their school can help break their traditional views on male teachers. Gregory Uba, who is an advocate for men in the lives of young children, lead the Creating Male-Friendly Environments in ECE. During his presentation, he brought up the fact that young kids do not have a male teacher until the fourth grade or later. He pointed out that the young girls get to experience the a connection with their female teachers throughout their childhoods. They have an educational role model to look up to, whereas young boys don’t get that experience until much later in their childhood. By the time they do get a male teacher, some boys have already found other role models that aren’t trained in education and children. Uba said it is hard for males in ECE, and even fathers, because they have been taught how to handle, care for and teach children but that they aren’t allowed to touch them in any way. April Guerrero, the CFES club president, said a lot of the problem is what is heard on the news about some male teachers being inappropriate with students. 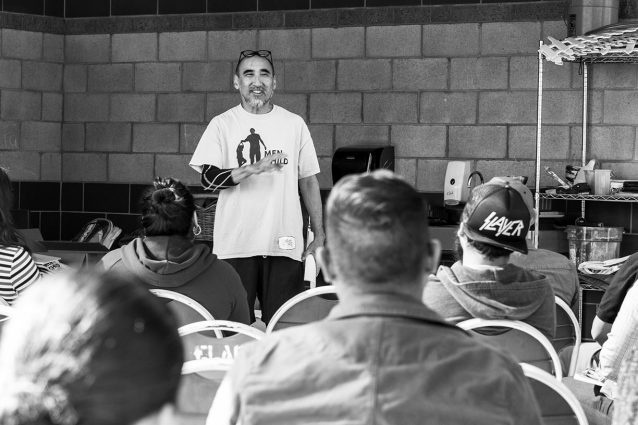 Guerrero, along with CFES, encouraged parents to volunteer more in their children’s classrooms and to not let the bias and stereotypes against male teachers ruin the child’s experience and education. Those who attended the conference were encouraged to bring resumes for networking and employment purposes. Other presenters were Robert Boyman, executive director for Pacific Oaks Children’s school and Edwin Cuz, a teacher at ELAC’s Child Development Center. The conference included free breakfast, informational booths and raffle prizes. More on the DAD Project can be found at www.dadproject.org.